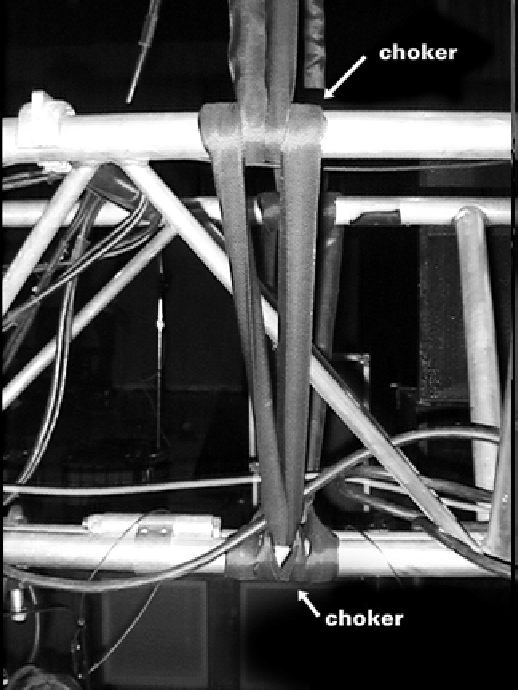 Figure 4.4: Slings used to rig a lighting truss to a set of chain motors. Note the choking scheme used to minimize movement of the truss. One of the most common ways to hang truss for flying is through the use of slings made of a synthetic material such as polyester. A modern sling consists of a synthetic fiber core encased in a woven synthetic casing. Slings of this nature tend to be very strong and quite durable, and by nature conform to the shape of the load they are carrying. This makes them suitable for many rigging tasks beyond that of hanging lighting truss. There are many acceptible methods for attaching slings to the truss to fly it. The most common involves the use of four slings. When the truss is flown point-down, a choker scheme is used, whereby the sling wraps through itself and around the truss. Each end of the truss uses two slings arranged in this fashion. Other methods exist where two slings can be used, but the choker arrangement is difficult to achieve, thus truss stability tends to be sacrificed.